Your gutters are one of the most important parts of your home as they protect your roof from moisture damage and the surrounding topsoil from erosion. 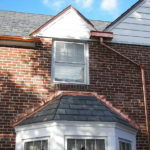 So why then would you choose a subpar gutter installation company? The right decision is to work with the trained and experienced professionals at Roland Slate Service. We offer a variety of different gutter types so you can choose the one that best suits your home, and our installation techniques and experience are virtually unmatched. In addition to all these services, we use our own team of highly trained gutter installation employees for every job we do. This allows us to maintain a high standard of quality to ensure optimal performance and longevity of our products. We even stand by their work by offering a one-year labor warranty. To learn more about why we are the premier gutter installation company in the Catonsville area, contact Roland Slate Service today.